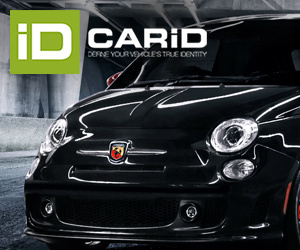 Another important car market with small presence of Fiat-Chrysler. 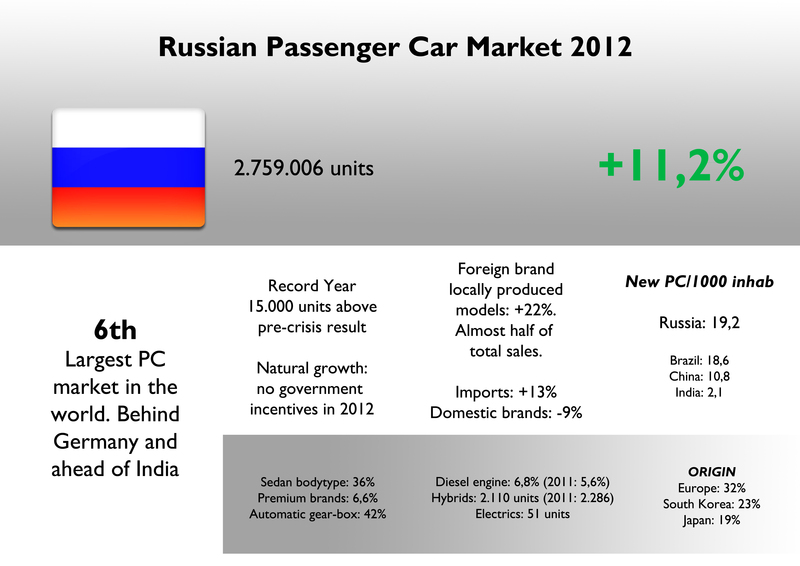 I am able to share with you a deep analysis of Russian car passenger market for 2012. This is an important market that unfortunately is not the place for good news for Fiat-Chrysler. Russia will soon become Europe’s largest car market and an important production hub for local and export consumption. Last year more than 2,9 million cars were sold in that country (LCV included), which means that it is just 150.000 units behind Germany. Passenger car market counts for 94% and it was up 11% and overcoming pre-crisis levels by 15.000 units. 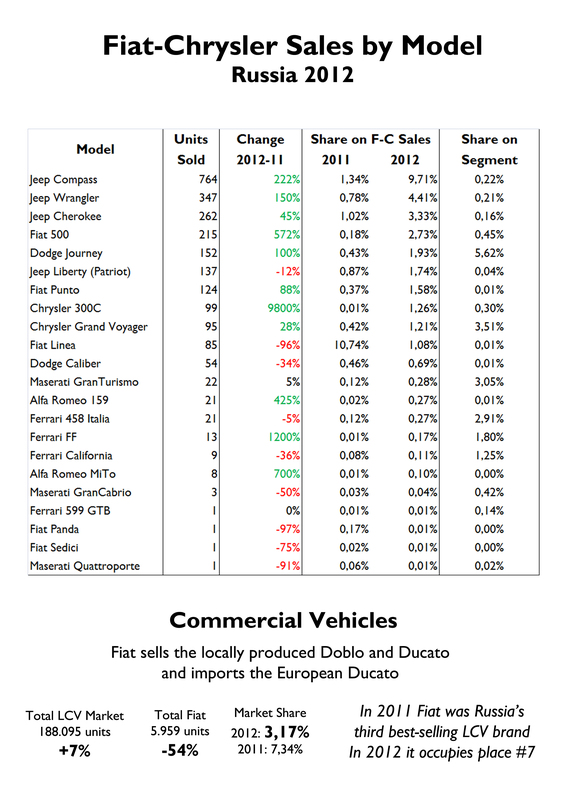 In this good scenario, Fiat-Chrysler is doing extremely bad with a very low market share and a very turbulent future. This analysis will concentrate in Passenger car market and will try to figure out what could be the best path for Fiat-Chrysler in the years to come. It is the world’s 6th largest car market (with or without LCV) and the third among BRICS economies. The good thing is that it is expected to grow even more in the next years as Russian population is very big and car industry hasn’t reached its maturity yet. In 2012 foreign and local car makers sold 2.759.006 cars, up 11%. The performance is better than China’s, Brazil’s, India’s, and of course any European market. It is just below USA’s excellent 2012 and far from the great results in the Middle East. Last year’s result means that Russian car market has already recovered from 2008 crisis and overcame the top figures by 15.000 units. The result is even better if it is considered the fact that last year the government didn’t make use of special loans for the industry, and it stopped the substitution incentives in 2011. In other words, last year’s result are completely natural and reflects the good momentum of Russian industry. 43% of car sales are financed through loans. 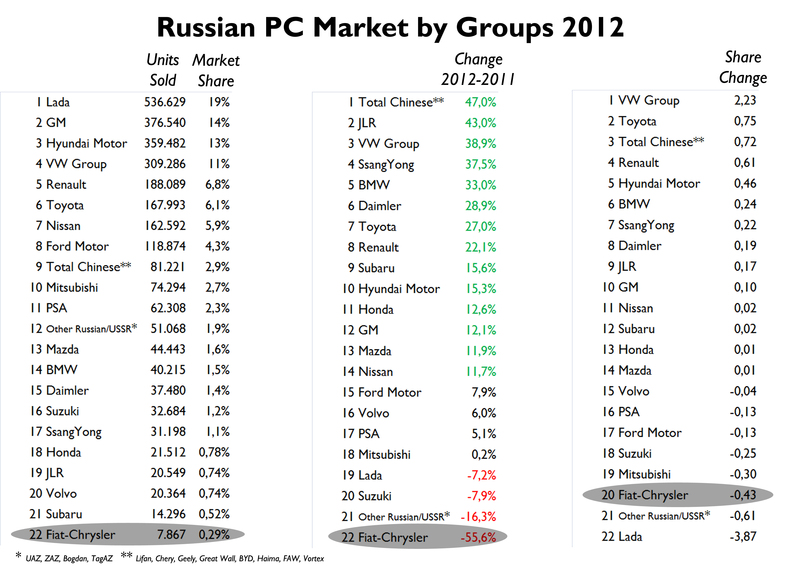 Contrary to what anyone would think, Russian car market is not absolutely controlled by local auto makers. Actually Russian and former USSR car makers own less share compared to what happens with local brands in Italy, Germany and France. 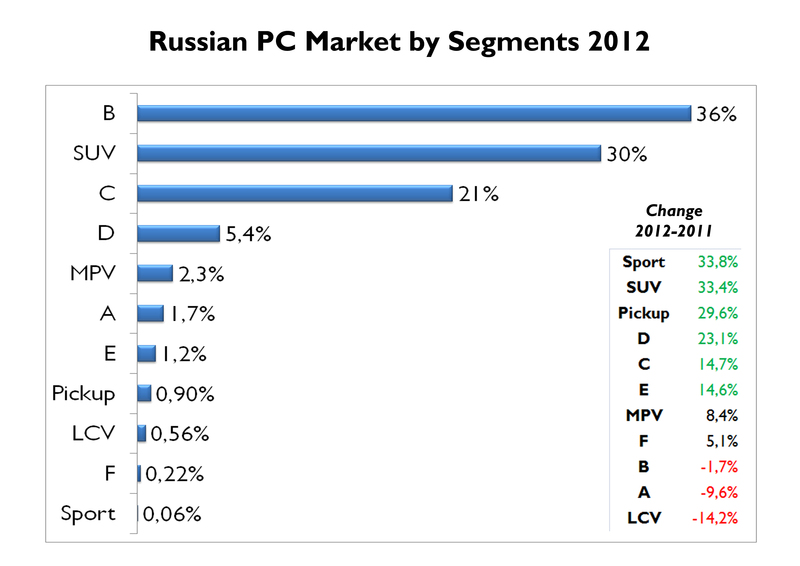 Lada, UAZ, ZAZ, Bogdan and TagAZ sold 21,3% of total PC sold in 2012. Their presence continues to fall as they become part of foreign auto groups and therefore its new partners gain market share. GM is the second largest car group in the country, but is closely followed by Hyundai, and VW. Lately, Renault, thanks to its marriage with Lada, is becoming very popular. But Russia is also the promised land of Chinese brands, which can easily sell their cars without the controls/barriers they have in Europe. Their cars fill very good with average Russian buyer as they are cheap, somehow big, and with a family focus. The arrival of better and cheap foreign brands (locally made) is having a big impact on local brands (Lada), as consumers realize they can have more modern cars for the same price. As it is partially influenced by Lada and its B-Segment cheap sedans, most Russians are used to buy this kind of cars. That’s why B-Segment counts for 36% of total market, with more than 1 million units. Nevertheless, the importance of these cars is decreasing as some buyers continue to move into SUV segment, which is now the country’s second largest. In fact, Russia is now world’s third largest market for this kind of vehicles (after USA and China). In Europe, it is among the largest in terms of share (30,5% against 30,9% in Iceland). There are several reasons that explain this boom. First of all, Russian roads and climate force many to have a resistant big car. Second, exchange rates and oil prices favour the price of cars and income of some part of the population. In the other hand, A-Segment cars are extremely unpopular, and so MPVs which count only for 2,3% when the average in Europe is 9% circa. Too bad, very bad the position of the group in Russia. If it is already bad in India and China, in Russia is even worse with a tiny 0,29% market share, down 0,43 basis points. 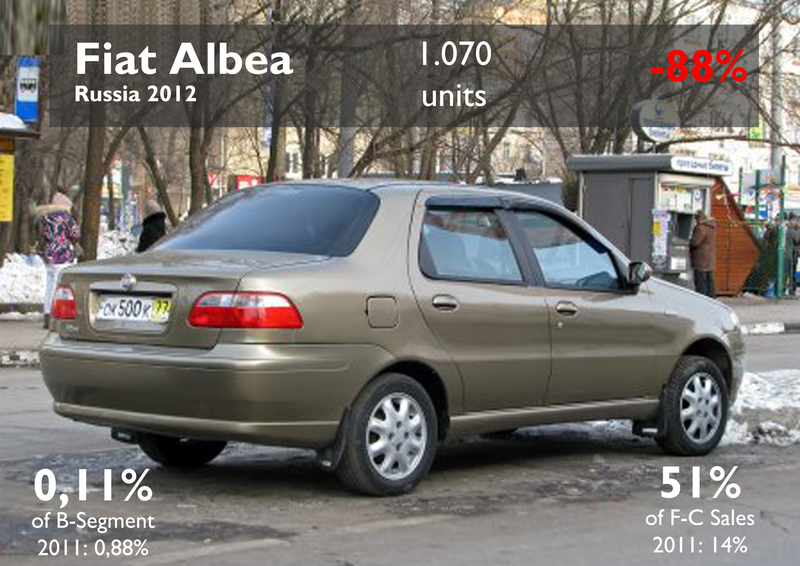 The whole group sold 7.867 cars of all brands, down a massive 56%, the highest of all car groups in Russia. This bad results are as shocking as the plans the group has and always has had for this important market. The reason for this drop is explained by Fiat brand, extremely unpopular among Russians. This brand’s registrations fell 83% as a direct consequence of the change of distributor and a shorter range of products. In late 2011, Fiat and Sollers stopped their Joint-Venture to produce cars in Russia, making more difficult to sell competitive products one year later. In total, Fiat halted its production and therefore the sales of its most popular models (those built locally) fell dramatically: 85%. Fortunately, the group’s sales rely on more brands and Jeep had a great performance in 2012, up 125%, and became the first of the group by volume. This is why Fiat placed Jeep as the first brand to be produced locally in the future. Fiat has been trying to find the right partner after Sollers decided to stop cooperation to build Ford models. After that divorce, Fiat signed a deal with Russian government to access to favorable tariff rates in exchange for capacity investment: 120.000 cars per year. Then they found a possible partner, Sberbank. This is Russia’s largest bank and one of the largest creditors of TagAZ, a bankrupted car maker with $800 million debt, which is looking for capital investment in order to use its production plants. According to the latest news, Fiat is the best candidate to operate this plant to produce Jeeps starting in 2014 with 60.000 units/year with maximum capacity of 150.000. Fiat-Chyrsler would invest from $100 to $200 million. TagAZ sold only 1.117 units last year but wants to build a $1,1 billion plant in St. Petersburg. 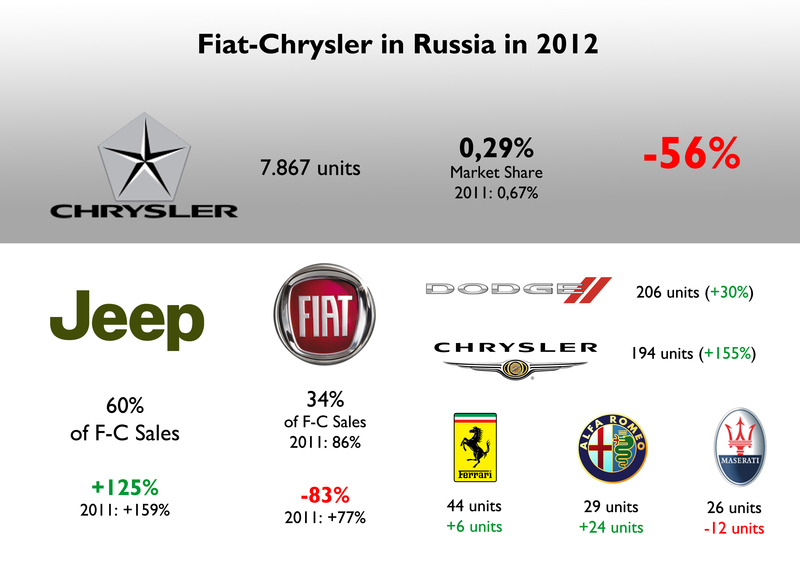 Still, this is not the first time Fiat has big plans for Russian market. They have been talking about it since many years ago and nothing important has happened yet. It is worthless to make a close analysis of the models sold by the group in Russia as most of them have marginal shares in their segments. The Grand Cherokee became the best-selling model, more than doubling its previous registrations and catching an important share in E-SUV segment. 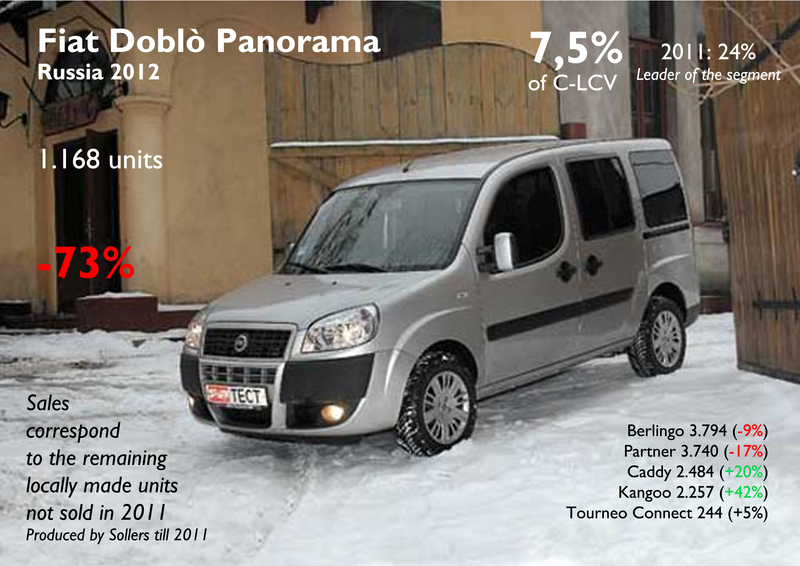 As production of Linea, Albea and Doblo halted in late 2011, their sales in 2012 corresponded to the remaining stock. Fiat imported some units of the 500 and Punto. Ferrari and Maserati sold more units than Alfa Romeo, while Dodge and Chrysler sold some units of the Journey and 300. 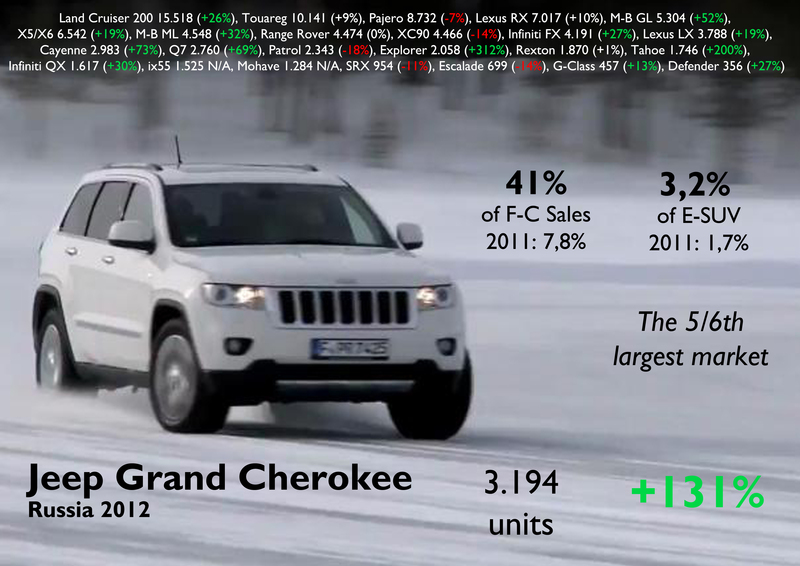 In total, all brands had very low sales, but only Jeep had an interesting performance thanks to the SUV boom. Fiat must accelerate its plans in this country (like in China and India), in order to increase its share up to 1% or 2% in the next couple of years. Jeep has an enormous potential but consumers won’t wait for to long to buy a locally made one. 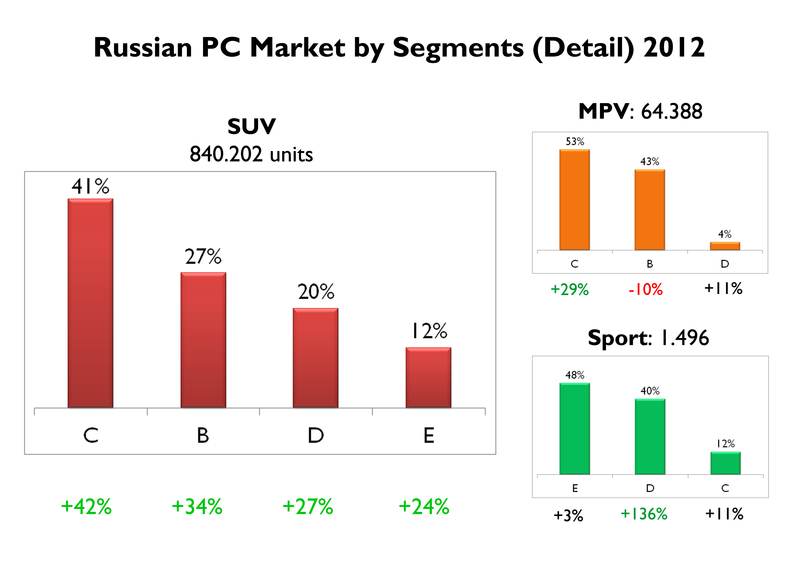 Russian SUV segment may be the world’s most promising in terms of potential. As long as there is no local presence, Fiat will continue to be the last option when buying a car and Jeep will continue to be the unaffordable but desired brand. In 2013 Fiat will introduce the Freemont and ultimate generation Doblo, and Alfa has already sold 9 Giuliettas in March. Source: WardsAuto. Many thanks to my friend Vitaly Plochotnikow from autowp.ru for the information and translation.